Antonio Pasqualin Lotti was born on 5th January 1667 in Venice. (The Venetian year started on 1st March, so the local year was actually 1666.) He was baptized on 25th January in the church of S. Marina, where his parents, Mattio Lotti and Marina Gasparin, had been married in 1662. Mattio was employed as a musician (NOT as the Kappelmeister!) 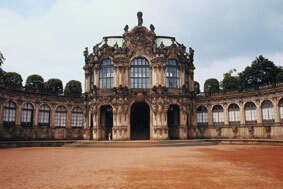 at Hanover from 1666 to 1679, so it had been erroneously assumed that Antonio had been born in Hanover. Antonio had at least two younger siblings: a brother, Francesco, (1672 - 1761); and a sister, Maria Melusina, born in 1673. Francesco became a Ragioniere (accountant) to the Collegio dei Savi (College of the Elders) of the Venetian Republic. Maria married a musician in Hanover. In 1683, at the age of 16, Antonio studied with Giovanni Legrenzi (1626 - 1690). In 1687, he started singing at the Cappella Ducale di San Marco. That year, he was also one of the first to enrol the Sovvegno dei musicisti di Santa Cecilia, a form of musicians' benevolent society, founded on 25 Nov 1687. On 30 May 1689, he drew a salary of 100 ducats for the position of cantor di contralto. On 6th August 1690, he was nominated as assistant organist (auito organista), and paid an extra 30 ducats for this work. He was unanimously elected to the post of 2nd organist (organista del 2 organo) on 31st May 1692. In 1693, his first opera, Il trionfo dell'innocenza, was staged at the Teatro San Angelo. Twenty of his operas were performed in Venice over the next 24 years, by which time his operatic work had attracted the attention of the Crown Prince of Saxony, Friedrich August (1696 - 1763). From 1697 to 1707, Lotti was also maestro di cappella of the Scuola dello Spirito Santo. On 22nd July 1698, Lotti received 50 ducats from the Procuratoria di San Marco for producing a book which contained one a cappella mass. On 17th August 1704, he made a request to take the position of first organist, “with the salary and benefits he presently enjoys,” following the death of Giacomo Filippo Spada (c.1640 - 1704). He was voted in by 13 votes to 1 against. In 1705, Lotti had a collection of madrigals published: Duetti, terzetti e madrigali a piu voci, by the Venetian printer Antonio Bortoli. The collection was dedicated to the Holy Roman Emperor, Leopold I (1640 - 1705), who sponsored the publication, but unfortunately died while the pages were still being printed. Only when Leopold's successor agreed to pay the printer was the printing completed. A manuscript of the music survives in Lotti's hand, dated 1703. The music was generally given a favourable reception, except for an acrid critique, entitled Lettera familiare d’un accademico filarmonico. The letter was anonymous, but it has long been thought to be by Benedetto Marcello (1686 - 1739), a former pupil of Lotti's. Marcello's pamphlet was never published, as the result of some 'intervention'. The collection is Lotti's only work to be published in his lifetime. Works from the collection are available from Ancient Groove Music here. In 1711, he travelled to Novara to attend a festival on 14th June, at which he provided some compositions. On 12 February 1714, he married the soprano, Santa Stella (c. 1686 - 1759), who was from Bologna. (Her name is often incorrectly given as Santa Stella Scarabelli or 'La Santini'.) In her will, she acknowledged the existence of a daughter, Lucrezia Maria Basadonna, who was a nun, and had been fathered by another man before she married Lotti. Santa Stella's dowry was 18,600 ducats. They lived in Calle dei Fabbri, in the parish of S. Geminiano, and also had a villa in the Veneto at Strà. After an offer of employment by the Crown Prince of Saxony, Friedrich Augustus II, Lotti was granted a leave of absence by the procurators of the Basilica San Marco on 17th July 1717, and he left for Dresden on 5th September 1717 with his wife and a band of Italian musicians, including the castrato Senesino (1686 - 1758), the bass Giuseppe Boschi and the soprano Margherita Durastanti. The librettist Antonio Maria Luchini also accompanied them. Much of Lotti's concertante sacred music, written in Venice, survives now in Dresden or in other locations as a result of his time there. 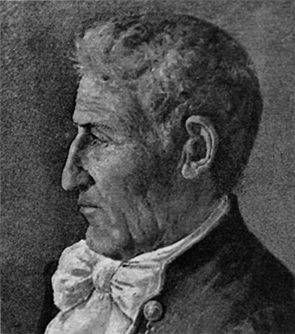 His pupil, Jan Dismas Zelenka was particularly important in preserving Lotti's music. These comprise individual Kyries, Glorias and Credos, and psalms for Vespers. Amongst these works was his Credo in F, which features the famous 8vv Crucifixus movement. Lotti composed three operas in Dresden, Giove in Argo, Ascanio and Teofane, as well as Il quattro elementi, a musical entertainment. Lotti returned to Venice in October 1719, and was allowed to keep the coach and horses that conveyed him as a parting gift. However, they would have been of little use to him in the calle and campi of Venice, and he is thought to have left them at his villa at Strà. He then concentrated on writing sacred music and returned to his position at San Marco. It is not known whether he deliberately made a decision never to compose another opera, or whether events merely transpired that way. On 2nd March 1732, Lotti asked his employers if his student, Giuseppi Saratelli (1714 - 1762), might deputise for some of his duties “at his own expense, reflecting the tireless service paid over the course of forty years”. The request was granted unanimously. After the death of the maestro di cappella Antonio Biffi (1667 - 1733), Lotti applied for the post, but it took three years to decide the appointment. In the first competition for the post on 8th March 1733, none of the candidates received enough votes to be given the job. The other candidates were Antonio Pollarolo (1680 - 1746), Nicola Porpora (1686 - 1768) and Antonio Pacelli. Lotti received 6 yes votes and 6 ‘no’s; the others all received more ‘no’s than ‘yes’es. The Miserere in Dm and Benedictus in C that Lotti wrote in this year are thought to have been composed as a showcase of his abilities. (Though some sources date them considerably earlier.) Lotti was eventually elected maestro di cappella on 2nd April 1736, this time in competition with Pollarollo and Giovanni Porta (1675 - 1755). 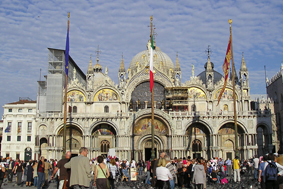 Nine of the twelve procurators of San Marco voted in his favour. The job paid 400 ducats and came with accommodation nearby. Just over a month after taking the post, he composed the madrigal Spirto di Dio ch'essend'il mondo, for the annual Marriage to the Sea (Sposalizio del Mare), a ceremony that was performed on Ascension Day (10th May that year) when Venice symbolically wed itself to the Adriatic. The practice continued every year from c. 1000 until the fall of the Republic on 12 May 1797. The lyrics were written by Zaccaria Valaresso (1686-1769), who also wrote the words for Lotti's oratorio, Gioas, re di Giuda (now lost). The madrigal is available from Ancient Groove Music. Lotti also taught at, and composed for, the Ospedale dei Mendicanti and the Ospedale degli Incurabili, two of the four Ospedali grande in Venice, maintained by the State as schools for female orphans and the abandoned – usually the children of courtesans. The schools were also funded by rich patrons who sent their daughters to the Ospedali for the benefit of the musical education that they received. Lotti's contemporary, Antonio Vivaldi (1678 - 1741) did similar work at the Ospedale della Pietà. Most of Lotti's teaching was done at the Mendicanti, on the Northern flank of the island; though he also composed Oratorios for the Incurabili, situated on the Zattere embankment of Venice's Dorsoduro – a few doors along from the church of Spirito Santo, where Lotti was for a time maestro di cappella. The house of the poet and lyricist Apostolo Zeno (1668 - 1750) was a few doors further along to the west. Lotti composed four operas to libretti by Zeno. 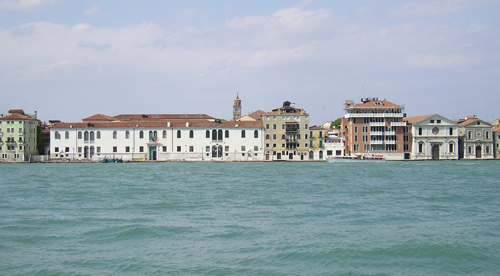 Zattere, Venice: Ospedale degli Incurabili is white building on left; Spirito Santo is 2nd from right. He was a member of the Sovvegno dei musicisti di Santa Cecilia, a form of musicians' benevolent society, founded on 25 Nov 1687. He was one of the first to enrol, and was still on their lists in 1737. I think that they do not so much consult the Honour of their Friend, because by separating from the Academy, they show a resentment which might be just, were the Dispute about an only Child, but for a Madrigal indeed it is too much, since Signore Buononcini can make others equal and much superior. He settled the matter with notarised testimony. The incident led to Maurice Greene's leaving the Academy and the fall of Bononcini in London as Handel's star arose. The madrigal is available from Ancient Groove Music. Lotti died of dropsy (oedema) on 5th January 1740. Records of the Procuratoria di San Marco show that on 3rd January, he was repaid 143 ducats for expenses relating to music at Christmas; on 9th January, letters were sent to the ambassadors of other city states, announcing the vacancy following his death. He was buried in the church of S. Geminiano, which stood at the west end of Piazza S. Marco, but was demolished by Napoleon in 1807 to complete the Piazza's arcade. It is thought that his tomb was removed to another location, but its whereabouts are unknown. There are a number of manuscripts of his Missa pro defunctis in Venice which state: si canta ogni anno nel Mese di dicembre il giorno del suo anniversario in S. Giminiano – “to be sung every year in the mass on the day of his anniversary in December in S. Geminiano”. In February 1740, The Pallade Veneta reported that solemn funeral services for Lotti were held at S. Salvatore. The confused date of December may relate to the anniversary of the first performance of the mass, for two brothers of the Priuli family of Venetian nobility. Lotti's music is characterised by a use of suspensions, chromaticism, discords and modulation. He is also a keen exponent of word painting, with words such as descendit and ascendit often sung to descending or ascending scales respectively. He writes with great care for voices, and is also highly technical, writing complex canons and fugues. His music had a great influence on his contemporaries. Manuscripts of Lotti's music survive in Handel's hand, and a growing catalogue of 'borrowing' from Lotti has been identified in Handel's choral work. The libretto of Handel's opera Ottone is based on that of Lotti's Teofane, and some have suggested that the similarity does not end with the book. Handel's Giove in Argo also uses the same libretto as Lotti's, with some modification. J.S. Bach's own library held a copy of Lotti's Missa Sapientiae, and it is thought by some that this may have informed his own B minor Mass. Lotti met both Handel and Bach. Of the 24 operas that Lotti wrote, only 7 survive complete: Alessandro Severo, Ascanio, Costantino, Foca superbo, Giove in Argo, Polidoro and Teofane. Arias and excerpts from another nine are also extant, and seven are thought to be utterly lost, though a great many arias survive in collections, and they have yet to be linked to particular opera. Of his 8 oratorios, only 2 are thought to survive: Il voto crudele and L’umiltà coronata in Esther. Ancient Groove is proud to announce a major new series of the sacred choral music of Antonio Lotti. Also a growing list of secular music, including madrigals, opera arias and instrumental sinfonias.